Sometimes Reader Danielle was a candidate for Miss Mountaineer of WVU - and let me tell you, this girl was ROBBED! She deserved the title. As a native of Wierton, she bleeds blue and gold. So when Danielle discovered this cocktail recipe while visiting Las Vegas, I thought - I MUST post it! 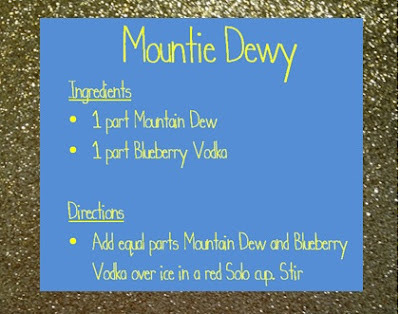 A bartender informed Danielle and her recent husband Will of the Mountie Dewy - a combination of Mountain Dew and Blueberry Vodka...um, YUM!